She had a two year old wrapped around her leg, holding on for dear life, while she bounced her crying newborn in her arms as we talked. I almost laughed off the comment–because my day had consisted of a crammed “to do” list, computer issues, a rushed meeting, dragging boxes to the car to mail, two dramatic daughters, several carlines and a tension headache. My life is hardly worth being envious of…. But I knew she wasn’t talking about my day. She was referring to my season in life. And in a blink, I was the one standing in the kitchen of an older friend with a strong-willed two year old and a nursing baby, longing for my days to matter. Dreaming of doing something big for God or at least getting enough sleep so I could dream. Or actually sleep. I suggested a few things she could do from home (and directed her to this book) and offered a few ideas for her to help me out if she wanted to and she seemed excited. But sometimes the best way to serve is to know our season. This isn’t to say moms of littles can’t serve. But first you need to recognize being a mom of small ones is service. Service is never small. Because you are the only one who can do it. We often long to do more because we don’t believe what we do matters. I love talking to others about saying yes. But we need to say it right where we are. Maybe changing diapers is how God wants you to change the world right now. I have more time to serve. My season allows it. But instead of having littles wrapped around me, depending on my body, I have kids who lean on me for a shoulder to cry on. And instead of sneaking out to Target when my babies were all asleep by 7pm like I used to, I’m up until 10pm listening to heartaches and headaches that tweens and teens often carry. But just like winter blossoms into spring, seasons of motherhood change too. Sometimes they blow in like a storm or break the ground like a pastel miracle, new seasons are always coming. So, don’t wish this time away. Embrace it. Enjoy it. Recognize it as your yes for now. Because tomorrow the winds may change and you’ll have an opportunity to step out in a new way. This just might be the most important thing you can do today. Your posts always hit home with me. I’ve struggled lately because this is the LEAST involved we have ever been with church activities–all we can do right now is attend and fill in with nursery occasionally. We used to do it all. I know it’s just a season, and I would never wish it away, but it’s hard not to feel that guilt, you know? Thanks so much for the encouragement!! Please remember that if you are feeling guilty, it is coming from the enemy. God’s Spirit will gently convict us but NEVER make us feel guilty. These days will not last forever. Praying God will give you His grace to enjoy this season of your life. Oh Kristen thank you for this! I too wonder how I could say “yes” like you have. What you have reminded me is that by being home with my own kids, maybe I have already said yes to what the Lord has tasked me to do! THANK YOU! I so needed to hear this today. Some days I look around at what all the other moms are doing and feel so insignificant because I’m not making a bigger contribution. Thank you for reminding me that my contribution to the kingdom are the two littles right here under my roof. I needed to hear this today. Thank you for your wisdom and affirmation. You speak life and give a fresh and beautiful perspective to this very tired mama of 3 littles. This is written with pure love and not one ounce of a condescending tone. Thank you!!!!!!! I was crying within the first paragraph. Enough said. It seems you heard my heart as I shared it with my husband last night. In this age of social media, it’s especially easy to see all the things being accomplished and to feel that I’m not doing something “big” for God. Thanks for the reminder that big is relative and raising our babies is an act of worship really. Thank you as always for writing from the heart. I am in the “empty nest” stage, but my offspring have yet to leave. The reality is they cannot afford to move financially but I fear they really need to emotionally. They came back from college to pay off loans. Loans are paid, feel I need to do some tough love and get them out on their own. But I look at their faces and can’t say “get out”. I guess what I am saying is all stages have their challenges. God does not give us what we cannot handle. I commend you for looking at the young adults you have raised to see what is best rather than at other people’s reactions. The world that our young adults are entering is not the same world that was there 15 years ago. The amount of people underemployed is huge and I would think that there is less temptation to behave immorally while living with parents. It used to be that our success as parents was defined by our kids meeting milestones: potty training by age 2, driving at age 16, living on their own by age 22… Regardless of the stage we or our children are in, I think that success is doing what God says is best and working with Him to grow God-honoring adults. It’s pretty cool that your family is working together in this tough economy. Thank you, Kristen! We can know this in our hearts, but for some reason, we need to be reminded if it often! Tears. Thank you for this. Thank you. This was beautiful – and spoke right to my heart this morning. I was recently asked to take on another leadership position. The seems like God’s answer directly to me. I think for this season, I’m meant to NOT take on more. But, there will be time when my kids are older, or when I’m not homeschooling, or when I’m not visiting convalescing relatives. There will be another season when I can serve outside of the home more. But for now, I need to say yes to my kids and my husband. I absolutely LOVE this. My youngest is 5 and will be starting Kindergarten in the fall so I’m transitioning out of one season and into a new one and, as with all transitions, I’m feeling mixed emotions. Thank you for this! This is a good word for everyone! Know your season. Saying yes to what we can where we’re at right now. This post resonates with me – because of one of your points – the best way to serve is to know our season and recognize it’s value. I came to terms with that last year and it’s made a WORLD of difference in my life. Momma’s happier, our home is more peaceful (chaotic – but peaceful!) and it’s beautiful to be able to say “no” to certain things right now because although I’d LOVE to be involved in XYZ…. it doesn’t fit my season at home right now, and these littles are the most important thing in my world and my biggest responsibility. When I quit trying to fit my kids around my to do list and started fitting my to do list around my kids – life became better. Thank you for this encouragement and affirmation! Thank you for this! It’s something I know in my head but have to hear it over and over and over before my heart finally gets it! Thanks for the reminder. I think you wrote this just for me. 😉 Thank you. Thank you. I often try to remind myself that this is a season. The days are long but the years are short. I have a 5 year old, 3 year old, almost 2 year old, and am due with #4 in March. After our journey through infertility, I know that we are blessed to have these littles. I wouldn’t trade them for anything in the world. But this isn’t how I saw my life. We are supposed to be living overseas. Ministering to the lost. Doing more. But that was my plan, not His. I don’t want to miss out on this season of littles that God ordained because I was trying to follow my own plan. Thank you for the reminder that in this season, sometimes my ministry is to these precious littles who need me. Tammy, I am also raising my grandchildren. My daughter asked us to adopt them and the Lord made that very clear to us that we were. We joke that we will never retire. But, I have the exact same sentiments as you have expressed. I also have been feeling a restlessness that I am not doing something more……This has been a difficult transition. I thought my season of raising babies was finished and was ready for different. Thank you for expressing your feelings. I don’t feel so alone. Kristen, thank you for writing this post. I hear the Lord’s voice all over this post. This is written so beautifully … you are so right! We are put into this role / “position” of mother … everything else is to the side, but God, for this blessing. Thank you! I needed this! I have four boys, ages 8 months to 8 years. You can imagine. Kristen your posts are always timely! I’ve shared you with so many this week because what you have written I knew would touch those I sent your way! Thank you for touching my life in ways you’ll never know. I dream of one day running into you! I needed this so badly. Especially today. I thank God for you and the gift He has given you. Thank you for sharing your heart with us. You are impacting lives. Annnd . . . here are the tears. Thank you for reminding me to enjoy my season! I REALLY needed this after another fun day of potty training among other things. “Sometimes the best way to serve is to know our season. And recognize its value…Maybe changing diapers is how God wants you to change the world right now.” Or in my case, changing pants and undies! I love my littles and am so thankful for this time with them. I don’t want to wish it away…even if it means doing yet another load of toddler laundry! Thank you for writing this. It brought tears to my eyes. Your words “envious… Of this season of my life… The best way to serve… Knowing the value of your season… Because you are the only one…” this is the first time it finally hit home for me. Especially as I struggle running after my 2.5 year old, knowing that I am around the corner with repeating it all over again, taking care of a newborn. Thank you for reminding me that I do have worth staying at home taking care of littles. THANK YOU! I’ve felt this for a year now and have been taking steps to step back from my serving before I had children. However, it is the hardest at my church. I am one of only 2 young families and the rest are retired aged couples. Anyway, this was a great encouragement to me to not give in to anyone except My Lord. Thank you for sharing your wisdom with me Kristin. Blessings to you! I’ve always thought “seasons” of life are better understood by women than men. I presently enjoy spending time with my two grandchildren. Having been thru this with my own children, I know these days of bottles and potty training and sleepless nights and rocking to sleep are fleeting. I believe I serve best by helping to care for these precious littles and supporting their parents in this, their most important task. A friend of mine sent me this and I am so glad she did. I am a mom of three littles under 5 and one on the way. I feel this in my day so often and even though God is calling me into a new season of “work and ministry” I still have to constantly remind myself that moving at a snails pace in the area of my life is ok… because I am fully devoted to what comes first, my family. However this reminder is always needed and that God will bring what we need in the season that we need it. Thanks for sharing and I look forward to reading more. 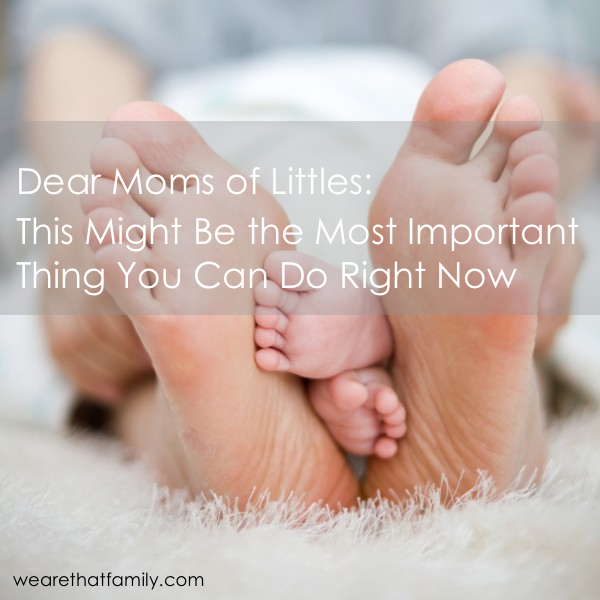 and something so many young moms probably need to hear today. I find it no surprise that the ones who often have a way of making me feel small….are the ones who think they have such a bigger life. But in truth, if they had it — they wouldn’t be trying to make mine feel small. This was so timely for me and I am sure many others. Thank you! What a beautiful post. I totally agree that the most important job I have right now is to be a mom to my daughter. I struggle with this though, as most do – trying to hold on to what is me and what I long to do while attending to my daughter and spending as much time with her as I can. A balancing act that inevitably ends up tipping one way or another for a while. I am a SAHM with a 3 year old and a 10 month old, and this season is tough. I feel like I am slowly heading out of the tough time because the 10 month old is becoming a little more independent, but still we have our days and moments. May God bless you in your season! never thought this would hit me that hard. I love this! I recently got married, and we’re talking about having little ones in the next year or two. The idea of staying home to change diapers and not working is pretty terrifying! Thanks for this blog, this is an ideal I’ll have to work hard to let sink into my heart before the kids come! That’s just beautiful. Thank you. needed to hear this today. met me and my recent thoughts right where I am. Thankyou for sharing! I felt God whispering this to my soul through you! Thank you. I am a working mom of an ADHD/Autistic boy who will be 8 at the end of this month, an almost 6yo who could possibly have ADHD as well, and boy/girl twins who turned 1 in January. I feel I don’t contribute to ANYTHING. Yeah, I pay the rent & bills & put food on the table. Yeah, I cook & clean & do homework & hug & tuck the kids in bed. Yeah, I pick out their clothes. Yeah, I do laundry. Yeah, I say prayers with them and shower them and kiss them goodnight and drag them to Church and answer the phone when the school calls and leave work to pick up my misbehaving or sick kids and try to work from home when any or all of my kids are sick – now that’s a task, I tell ya, and it seems pointless. Those days, I want to just log off my work laptop and be JUST a mom. Yeah….I DO a lot. I never stop DOING. So where is my LIFE?! Thank you for the reminder…this is a season. You’re so right. Thank you…very much…I needed this encouragement. I’m a working Mom with a 1 year old son. Much as I wanted to quit my job and be a full-time mom since I believe that my husband can support me and our kid, but I have a family to support. My parents are old, with my father’s pension pawned when my sis gave birth via CS out of wedlock, and who is also jobless at the moment. My other sis has to quit her job to help with the 2 kids (my son and my nephew) at home. Sometimes, I think it’s unfair that my sis can afford spending time with her son without an income but simply relying on me and our relatives while I work just to feed the whole family and on the process sacrificing my time with my son. I have a lot to be thankful for, a supportive and loving husband, a healthy son, but sometimes I wanted to be selfish too, but I can’t seem to be. What should I do or think of? You should look after your family – your husband and your own children. Part of getting married and having children is creating your own family and learning to put them first. Your siblings’ bad decisions are not your burden. What I need to hear, right when I needed to hear it. Thank you so much. Really good, Kristen. I am fully convinced that what I’m doing right now is very important (I have five kids, ages almost-8 down to 18-month-old twins), but I am so grateful for other mamas who aren’t in my current stage of life proclaiming this so boldly because we mamas of young’uns definitely need more of this encouragement instead of the unspoken understanding that “some day” what we do will matter. I’m also thankful for this post! As someone who has “been there” it’s nice to be reminded that this IS an important season. Been rocking a sobbing 9week old for hours and as he finally settled in my arms picked up phone and read this piece. THANK YOU I needed to read it today I needed to feel some sense of purpose. Yes. SO MUCH YES. Thank you! My three littles (under two!) thank you, too! I’ve got more on my waist from love, but this ^^ is different. I’ve got more in my waist from love, but this ^^ is different. 1. TOTALLY on point…love it. Or maybe I get them, but this might be one of the easier and less lonely. All of our friends are chin deep in kid care too, my little guy is healthy and small enough that things aren’t too tough yet, his sisters are busy and keep our home lively… Very scary to think that all the other kids will grow up and the parents will move on and we will continue in total daily care…. Kristen, this was EXACTLY what I needed to hear this week. I’ve been struggling with my good, better, and best choices, and putting the right things on my to do list. I do need to focus on my season and what is most important. Thank you! So, I stumbled upon this blog today, and I really needed it. Thanks, so much. I too, have been there. Raised my three, retired hoping to have my time. Due to poor choices one of my daughters made, I am now raising her three little ones. Trying to enjoy every minute of them, as my heart breaks seeing what their mom is missing! Make your life choices wisely, Moms! The things I wish I had done differently as my children were growing up, I fell I have a second chance to make a difference! Yet it’s much harder 30 years later! Such a simple truth, but soon lovely to hear!